Charities Institute Ireland (Cii) has announced the appointment of Liz Hughes as its new Chief Executive. Liz Hughes is a former Head of ACCA Europe and ACCA Ireland and will take up the appointment on 1 April 2019. Cii was formed in 2016 following the merger on ICTR and Fundraising Ireland, two key sector bodies who agreed that there was a need to create one, strong single voice to represent their combined members and the wider not-for-profit sector. Cii is focused on raising standards in the industry, and promoting greater transparency, openness and integrity across the sector. Minister for Finance and Public Expenditure and Reform, Paschal Donohoe TD, has today (Friday) announced the making of the Value-Added Tax (Refund of Tax) (Charities Compensation Scheme) Order 2018, which was signed into law on 18 December 2018. This Order gives effect to the Budget 2018 announcement of a VAT Compensation Scheme for Charities, which will allow charities to reclaim a proportion of their VAT costs based on the level of non-public funding they receive. A capped fund of €5 million will be available in 2019, to finance payments under the scheme in respect of claims of VAT paid in 2018. Where the total amount of claims in a year exceeds the capped amount, charities will be paid on a pro rata basis, i.e. where the total value of claims is double the capped pool amount, each charity will receive 50% of their claim. Minister Donohoe said: ‘The VAT Refund Order is the product of significant engagement between officials of my Department and the Revenue Commissioners and the charities sector and I want to thank the sector for its positive contribution to this process’. The facility to make claims under the scheme will be available on Revenue’s Online Service from January 2019. Guidance on the scheme for charities is available on the Revenue Commissioner’s website at www.revenue.ie. Charities Institute Ireland (Cii) and The Wheel have jointly welcomed the signing by the Minister for Finance of the Ministerial Order that brings the VAT Compensation Scheme for Charities into effect. The €5million scheme was announced in Budget 2018, and compensates charities for a proportion of the VAT they incur on expenditure related to independently raised income. Charities will be able to claim for VAT paid from the 1st January 2018, and to make claims once a year for VAT paid in the previous year. Irish charities are major buyers of goods and services in the economy and are liable to VAT on their purchases. The new scheme will return some of that money to charities to enable them to enhance services and provides an incentive to increase their fundraising efforts. “We expect that many charities will benefit from this new scheme, which represents a major acknowledgement by government of the role and contribution of charities to Irish society. If the total claims exceed the €5 million allocated, charities will be paid on a pro rata basis. In time, we hope that this scheme can be expanded after the initial three-year period to which the Minister has committed,” Scott Kelley and Deirdre Garvey said. Charities Institute Ireland welcome the publication of the Charities Regulator’s new Code of Governance for Charities. The Charities Regulator will provide a suite of guidance to assist charities and charity trustees to meet all of the core standards outlined in the Code. 2019 - will be a year of learning and preparation for charities. 2020 - will be the first year that registered charities are expected to comply with the Code. 2021 - will be the first year that registered charities are expected to report on their compliance with the Code. For further information about the Charities Governance Code click here. To download a copy of the Charities Governance Code click here. Charities Institute Ireland welcomes comprehensive Report on Social and Economic Impact of Charity Sector. The Chief Executive of Charities Institute Ireland (Cii) Lucy Masterson has welcomed the publication by the Charities Regulator of a comprehensive report on the positive social and economic impact of the charity sector in Ireland. Government has many roles in relation to the charity sector. It is the key funder and sets the regulatory framework. It can provide the incentives to encourage private investment. It can also create the gaps into which charities must step to ensure protection for the most vulnerable in our society. It is right to demand the highest standards of the sector, but Government agencies should also operate to the highest standards of governance and engagement when dealing with the sector and individual organisations. At times, Government can also create unnecessary burdens on the sector, through duplication in reporting, unpredictability in income and confusing its roles as funder, legislator and reactor. Regulation which recognises the diversity of registered Irish charities. It needs to be particularly sensitive to the large number of volunteer-led, low income and grassroots charities. “Today’s report by the Regulator is to be welcomed and provides solid evidence on which to base future policy” Lucy Masterson concluded. 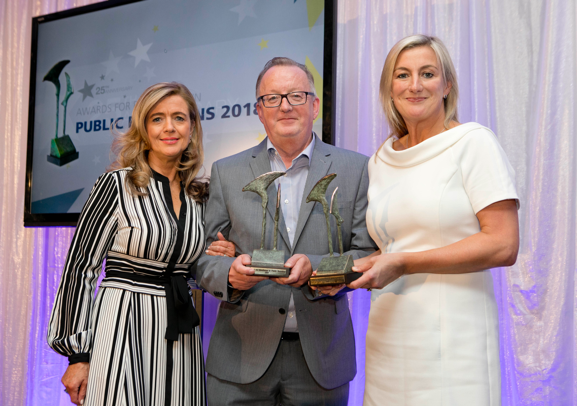 We were absolutely thrilled when the long standing campaign for the introduction of a VAT Compensation Scheme for Irish Charities was recognised with the prestigious award for best public affairs campaign at The Public Relations Institute of Ireland Awards on June 22nd at The Shelbourne Hotel. As our members will know, in 2016 Sheila Nordon who had led the campaign for over a decade under The Irish Charities Tax Reform Group handed the baton over to the newly formed Charities Institute Ireland. Achieving a positive outcome to the campaign for a VAT Compensation Scheme was a priority of the Board and Executive of Cii. Pictured at the PRII Awards, Rhona Blake PRII, Gerry Naughton, Drury Porter Novelli, Lucy Masterson Cii. We worked with Drury Porter Novelli on a campaign of engagement with Government throughout 2017. In the era of new politics, a key part of the strategy was to achieve demonstrable broad cross-party support for the scheme and Cii met with elected representatives and/or their advisers of Fine Gael, Fianna Fáil, Sinn Fein, Labour, the Independent Alliance and the Independent (non-Alliance) Ministers. In the fortnight before the Budget, member organisations of Cii wrote to politicians across the Oireachtas seeking their support. This grassroots approach complemented the targeted approach of earlier months. One week before the Budget a letter was sent to the Taoiseach and Minister for Finance. This collective approach bore fruit when the Minister for Finance Paschal Donohoe announced the introduction of the long awaited Scheme in Budget 2018. The Consultative Panel brought together members with wide and varied experiences in the charities and corporate governance sector. Their deliberations were supplemented by a public consultation process (involving almost 1,200 individuals and organisations), international research and presentations. Charities Institute Chief Executive, Lucy Masterson, was a member of the Panel. The Panel found there was a need for a code of governance for charities, and that the Charities Regulator should produce it. The panel proposed that the governance code should be principles-based and should operate on a ‘comply or explain’ basis by charities. It also proposed that the code’s content be developed in collaboration with the charity sector and that the code should be proportionate. Today the Charities Regulator launched ‘guidance on charities and the promotion of political causes’. Many Irish charities and their trustees have limited resources and increased pressure and demands to ensure their charity is compliant. This practical guide highlights the rules which apply to their organisation when engaging in activities to promote a political cause and will help them to comply with best practice. While the guidance is useful, it has to be remembered that in addition to the Charities Regulator that charities are subject to SIPO and the Lobbying rules so there is no shortage of regulation in this space. Charities Institute Ireland warmly welcomes the announcement by the Minister for Finance in Budget 2018 to establish a VAT Compensation Scheme for Charities. Irish Charities have campaigned for this type of Scheme for many years and today represents a major breakthrough. It was the reason ICTRG was established over fifteen years ago and has been a core part of the ICTR / Charities Institute Ireland advocacy agenda since day one. Over recent months our members have been writing and calling TD's and Ministers on this issue so we are absolutely thrilled that the hard work of so many has finally paid off. A very special thanks and acknowledgement must go to Sheila Nordon. Over the years Sheila was the key driver behind this campaign and never gave up hope that the scheme would be introduced. At Charities Institute Ireland we have been proud to continue with Sheila's work in carrying the VAT baton and we look forward to continuing to represent our members on policies that benefit the entire charity sector. We want to thank Minister Donohoe, Taoiseach Varadkar and his Government colleagues for taking this initiative, after extensive analysis and scrutiny. Irish charities are major buyer of goods and services in the economy and are liable to VAT on their purchases. As a result, money raised for charitable purposes is often returned to the state through the payment of VAT. Charities Institute Ireland has also been encouraged by the support for this scheme from parties and independents across the Oireachtas and we are grateful for that backing. Evidence of the role of the charity sector in a flourishing society. The deadline for interested parties and submissions of research proposals is Friday 15th April at 12:00pm. The proposals should provide a brief outline of the proposal with suggested methodology, timelines and associated costs.